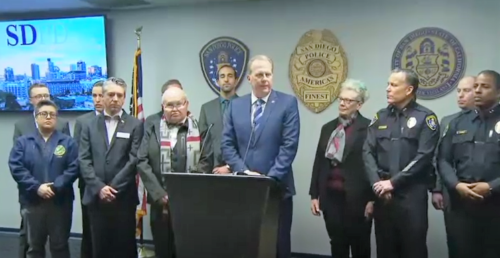 San Diego Mayor Kevin Faulconer discuss The Asian Bistro shootings in Hillcrest at a news conference Wednesday. SAN DIEGO–San Diego police released the identity of the armed suspect accused of multiple shootings at The Asian Bistro in Hillcrest Tuesday night. The man, 29-year-old Stefano Markell Parker, a San Diego resident, was arrested that same night and charged with nine counts of attempted murder, one count of a felon in possession of a firearm, and one count of a firearm in the commission of a felony. He was booked into county jail. There were nine people in the restaurant at the time of the shooting, authorities said. The restaurant, located on the 400 block of University Avenue, was hit with several rounds that shattered windows and left holes in the building. No one was injured in the shootings. The mayor said San Diego police officers will conduct more frequent patrols in the Hillcrest community. Assistant San Diego Police Chief Albert Guaderrama said Parker does have a felony record and was arrested for a homicide in Alabama several years ago. How the rifle ended up in Parker’s hand is a question investigators would like to answer. “What I can tell you that the gun was not reported stolen. Obviously, it was not registered to him,” Assistant Police Chief Guaderrama said. Guaderrama added that Parker could face hate crime charges. But cautioned that the investigation was ongoing. Anyone with information on the incident can call Crime Stoppers anonymous tip line at (888) 580-8477. Visit the Crime Stoppers website at www.sdcrimestoppers.org for more information on how to send anonymous web and mobile app tips.